Terministic Screens and Screeds | Thinking rhetorically about culture, politics, and pedagogy. The following post is a reflection on events that happened over four years ago. Although there are many more relevant (and damning) details that a thorough fact-checking would turn up, I wanted to quickly write down my initial reaction to the The Chronicle‘s recent article. The Chronicle of Higher Education reports on a forthcoming article in the Kentucky Law Journal that provides new analysis of the 2015 upheavals at my alma mater, the University of Missouri, and the resulting damage to the University’s reputation. The author, Ben Trachtenberg, argues that key factors that made the fallout particularly devastating was in-fighting at upper levels of administration and their failure to respond to student concerns in a timely manner. In support of Trachtenberg’s argument, I want to offer my experience as a student activist at the University of Missouri during 2010 to 2014, the years leading up to the events Trachtenberg analyzes. During these years, I was an MA/PhD student in the English program, specializing in rhetoric and composition. During this time, I also gave birth to two children (2009 and 2012) who were both lucky enough to get spots at the on-campus daycare for children of students. In 2010 I was one of three students who formed a student group for parenting students. While our general goal was to provide mutual support and advocacy for our fellow-parenting students, our specific goal was to keep the daycare open. There was a constant, low-level threat to close the 40-year-old center that provided childcare to approximately 50 children at competitive (but not at all bargain) rates. In fact, one month of full-time care was enough to wipe out the average grad student’s monthly stipend, so many parenting students were paying for these services with student loans. The center was far from perfect. Administration expected it to run on a shoe-string budget, and the lack of investment in curriculum and support for the teachers was blatantly obvious. Although there was some diversity, there was also a general sense that spots tended not to open up for students of color as quickly as they did for white students. Still, the center was on-campus which made it substantially more convenient than most other options, especially for international students who often lacked transportation options. The teachers demonstrated a meaningful attachment and care for the children. Even though the educational component left much to be desired, the teachers’ warmth and affection for the children ultimately outweighed my concerns. After a day of teaching, grading, dissertation-writing, or assisting at the Campus Writing Program, I would pick up my thriving daughter and son, and we would walk the half mile home to eat whatever I had tossed in the Crock-Pot that morning. 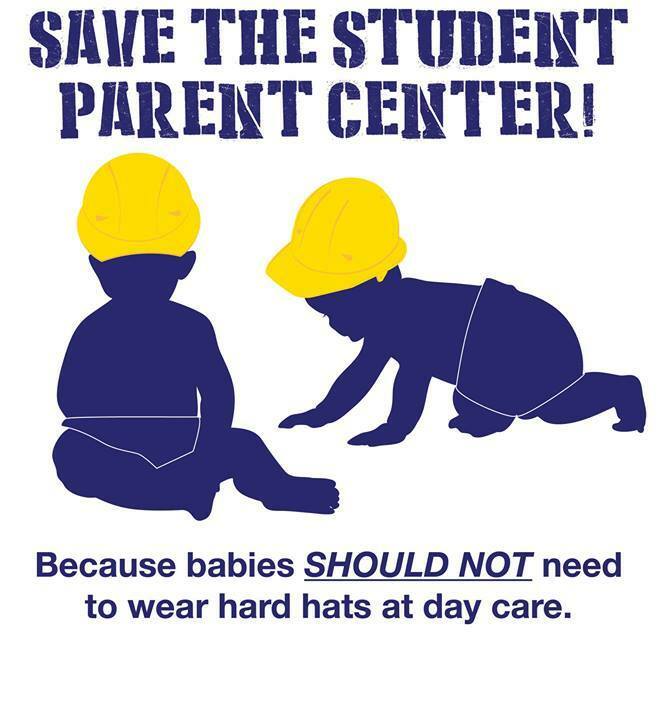 As the fees increased over the years amid declining interest on the part of the university to invest in the staff and children, our student group reached out to graduate student organizations, the Black Student Union, the Student Government Association, and an assortment of deans and administrators to raise awareness and support for the daycare. Everyone agreed it was a valuable and worthwhile cause, but it was impossible to find anyone on campus who could actually do anything about it. An administrator responsible for the Center would say his hands were tied by his supervisor’s priorities, and when we met with his supervisor, she would say that she was simply making decisions based on the information she had been given by him. The administrator responsible for the daycare’s budget had been heard to say that parenting students belonged at community college instead of Mizzou. The perpetual run-around finally came to a head early in the spring semester of 2014 when a 2nd-story concrete deck at the apartment complex where the daycare was located collapsed. A firefighter who responded to the emergency call was killed by a falling slab of concrete. Although the University had ignored earlier reports that warned of the possibility of the aging buildings’ collapse, this incident prompted them to immediately shore up the remaining decks, including that of the building where the daycare was housed. For weeks afterward there was much discussion about what would happen to the aging apartment complex. In post-war years since the apartments had been built, the area had been declared a flood-plain, making demolition and rebuilding impossible we were told. Our student group, headed up by mostly white students relatively new to activism and nervous about making the wrong move, recognized this was the opportunity certain members of administration had been anticipating for years–the closure of the daycare. So we circulated a petition online and on campus. We wrote a carefully worded email to our professors, politely asking for their support if they didn’t mind please. We spoke to reporters about how critical the daycare was to our academic success. We also requested a meeting with R. Bowen Loftin, the Chancellor who would eventually be forced to resign. In the meeting, we made our painstakingly worded case for rebuilding the daycare in an new location on campus. Once more we heard conciliatory administrator-speak from the Chancellor as he regaled us with his own experiences in graduate school and spoke of all the obstacles to re-opening the daycare. The biggest one, of course, was that there was no funding available because, he said, funders specify how they want their donations spent. When I asked why we couldn’t look for a funder who would be interested in sponsoring a new daycare, he looked at me as if I had just suggested we rob a bank. “We can’t do that!” he said, inexplicably horrified. In retrospect, we realized that we were talking to a brick wall. At the highest level, the University did not care about the needs of parenting students and although the Chancellor wouldn’t tell us what his plans were, he was sending a message that he had no intention of hearing us either. Over the remainder of the semester, the University demurred, not making a commitment one way or the other. This refusal to commit made it difficult for our group to engage people effectively. We would spend our lunch breaks at Speaker’s Circle, asking people to sign our petition to rebuild. “Of course the University will rebuild the daycare,” people would say as they declined to sign, looking at us as if we were paranoid freaks. Brilliantly, the University finally announced its position on a Friday in May, the day before graduation. I was buying a pair of shoes when a friend called to tell me about the announcement. By then, people had either left campus for summer break or were consumed with finals grading or graduation. The decision was a “no” presented as a “yes.” The University stated that it would accept bids from private companies to build and run a private daycare on campus. Translated, the University was offering land to a private entity to come to campus and make a profit off of students. Of course, as anyone knows, childcare is not a lucrative business in our capitalist system, and the bids surely did not come pouring in. As far as I know, the daycare was never spoken of again. That weekend at graduation, we were spoken down to by Chancellor Loftin one last time. I crossed the stage with my empty diploma protector grateful to have completed my PhD on schedule and landed a coveted tenure-track job, but dismayed at my failure to be an effective activist. But what I had learned, in addition to my formal education, was that fighting a system through approved channels was a recipe for failure. The system was set up to be resistance-proof. Taking a stance of deferential civility, recognizing the authority of our elders, and asking nicely for crumbs got us NOTHING. But that’s not really the point I want to make here. One of the students at the meeting with the Chancellor that day would later be at the center of Concerned Student 1950, the group that led the 2015 protest about the Administration’s refusal to address the persistent undercurrent of racism on campus. I don’t know what all she took away from that meeting, but I do know that she witnessed first-hand the utter uselessness of our approach. Watching the reports roll in from the distance of my new job in a different state, I cheered Concerned Student 1950 on. *In a manner of speaking. Of course, there is still much, much more work to do. Last month I accompanied a group of students and another faculty member to Amsterdam and Italy as part of a theological anthropology class. These destinations–one in northern, Protestant Europe and the other in southern, Catholic Europe–provided thought-provoking theological and cultural counterpoints to each other. Of course, in the Europe I visited last month, this martyrdom was never mentioned on the tours or in the museums and monuments. Instead, in Amsterdam we heard about Catholics who worshiped in secret when Protestants came to power and in Rome we heard about the persecutions early Christians endured at the hands of the Roman emperors. As we toured the crypt beneath St. Peters, the freshness of that persecution was palpable in the tour guide’s narrative, implicitly framing the opulence of St. Peter’s above as a triumph against all odds. The underdogs finally got their due. As others have eloquently pointed out, Anabaptists today are no less likely than Catholics to downplay their current privileged status, preferring to overwrite it with their origin story of martyrdom. And as this NPR story documents, Americans as a whole are no different. Our white-dominated culture cries “Freedom!” from the tyranny of taxes and government without representation all the while conveniently ignoring how our entire culture and economy was built on the enslaved backs of others. We pat ourselves on our backs for “defending freedom” while ignoring all the innocent civilians we kill to do it. We pride ourselves for our advanced culture, while ignoring the millions of bodies chewed up by the machinations of colonization and globalization that funded it. This happens on an individual level too when a person gets stuck thinking of him- or herself as they were when they were a helpless, impressionable child and continuing to engage with the world as if they were still that helpless impressionable child and not a capable adult. How many bullies are inwardly punching up at a bigger bully as they beat up on defenseless, less-powerful bodies in front of them? How many relationally aggressive people see themselves as just getting their long-deferred due as they ruthlessly exclude and marginalize lower status people around them? But just because we can slide so easily between the roles of the oppressed and the oppressor doesn’t mean these roles are meaningless or that they are inevitable. Once we know better, we can do better. As a teacher quoted in the NPR story points out, those of us living today are not at fault for the systemic racism our predecessors passed down to us, but we will be at fault twenty years from now if we don’t do something about it. Being free from blame doesn’t free us from responsibility. As the #metoo campaign swept across my Facebook feed, gathering strength from the countless stories of sexual harassment and abuse in the workplace, and eventually reaching tsunami strength as it approached halls of power, it occurred to me that I didn’t really have my own story to share. At least not one like the many I was reading. I’m sure people from my very conservative upbringing would have their own explanation to offer–as if the body-shaming, sexism, and misogyny of religious patriarchy somehow deserves credit for this absence. And as if family reunions and churches aren’t crawling with perpetrators, collaborators, and silenced survivors. As I began to think through each job I’ve held over the past two decades, I realized that almost all my bosses have been women. Aside from a couple male-female co-supervisor situations, I’ve never directly reported to a male boss*. Now let’s be clear–some of those women were certainly difficult to work for, and I have no complaints about the one male boss I did have. But surely it’s not just coincidence that I haven’t experienced the workplace harassment and assault that so many, many women have AND have primarily worked for women. What if supporting more women in positions of professional authority isn’t only a matter of basic justice and fairness but also about making workplaces safer for everyone? *I suppose having a male academic chair for a year would count, although “chair” and “boss” are not interchangeable terms. Over the past few days I’ve been listening to excellent podcast commentary on the #metoo phenomenon and the resulting ground-swell of sexual assault accusations in the news. As a result, I decided to scrap my original plans for my Rhetoric and Political Engagement class today to focus on this topic instead. Since it was a last-minute change near the end of the semester when deadlines are breathing down the necks of students and faculty alike, I decided to go with a less-is-more approach. Before class, I sent the students links to the podcasts (and one article) so they had a general idea of what to expect, but I didn’t require them to listen ahead of time. Since we would be listening to podcasts (no visual component), I brought several adult coloring books and colored pencils to class for keeping our hands and eyes occupied if students so chose. I also distributed MeToo Discussion Questions to serve as a listening guide. We paused between segments for questions and discussion. Learn about the official process for dealing with sexual harassment complaints at the U.S. Capitol–and weep. As allegations of sexual misconduct continue to dominate the news, a look at how we are dealing with high-profile offenders and who is being ignored. Plus, a critical reexamination of Bill Clinton’s reputation, the difficulty of processing good art made by bad people, and how to brace ourselves for the potential backlash. Rebecca Traister [@rtraister], writer-at-large for New York Magazine, on how sexual harassment stories at the national level resonate with our own familiar relationships to power and gender. Michelle Goldberg [@michelleinbklyn], columnist for The New York Times, on the claims of sexual misconduct made against Bill Clinton. Sarah Smarsh [@Sarah_Smarsh], writer and reporter, on the sexual harassment accusations that won’t make the news, especially those of the working poor. Lily Loofbourow [@Millicentsomer], culture critic for The Week, on preparing for a public backlash against the post-Weinstein moment. Kathryn VanArendonk [@kvanaren], TV critic for Vulture, on how to parse the fraught relationship between artists and their art, particularly when those artists are accused of violence or abuse. Their discussion of #metoo and the other podcasts posted here (On the Media and The Daily) begin about 40 minutes into the show and runs for about 30 minutes. I’m thinking about how I might run a class like this next time, what readings I might pair it with , or how I might adapt it for a class on rhetorical circulation or women’s and gender studies. What comes to your mind? Economic Justice Lesson Plan This lesson plan and activity pairs well with a selection of Nickel and Dimed by Barbara Ehrenreich. It helps give students a sense of the reality of trying to get by on minimum wage–even in a rural area with a relatively low cost of living. Reblogging my recent guest post at the Teaching PALS blog. I finished my classes last May running on fumes. All year I was teaching new classes, trying out new strategies, attempting to keep students engaged with challenging material and projects. The semester wasn’t a flop, but the rewards felt meager when I compared them to all my efforts at professional development, new classroom activities, and stimulating discussion starters. My mind kept returning to a post a graduate school friend wrote now nearly a year ago about conserving energy while teaching, but I kept coming up short on insight into what that might look like in my classroom. Last year when a more senior colleague and hugely successful teacher observed my classroom, she encouraged me to let students do more of the work and to cultivate a little less formal atmosphere. Her words resonated with me–I didn’t like dominating the classroom with my voice either. But it’s hard not to also hear this feedback as a prompt to change my personality to be more of an entertainer. Still, I spent the summer trying to think of ways to liven things up in ways that wouldn’t feel too weird and contrived. As long as I’ve been teaching, I’ve been well aware of the evils of lecturing and hierarchical teacher-student dynamics. But I’ve also been in many classrooms where student-led discussions fell flat and where attempts to get students to take ownership of their own learning resulted in students feel lost rather than empowered. On top of that, working at a teaching institution results in a lot of pressure to be awesome at teaching, and for me that translates to a meticulously prepared lesson plan, non-stop demonstrations of brilliance, and blissfully happy students. No biggie. At the beginning of this semester I randomly picked up a book left behind by a predecessor, Teaching with Your Mouth Shut by Donald Finkel. In the book, Finkel describes a discussion technique where in each class session a different student takes questions from the rest of the class and writes them on the board. The students select the 3-4 questions they most want to discuss, and the teacher sits back while the students dive in. Yes! A format I can follow! 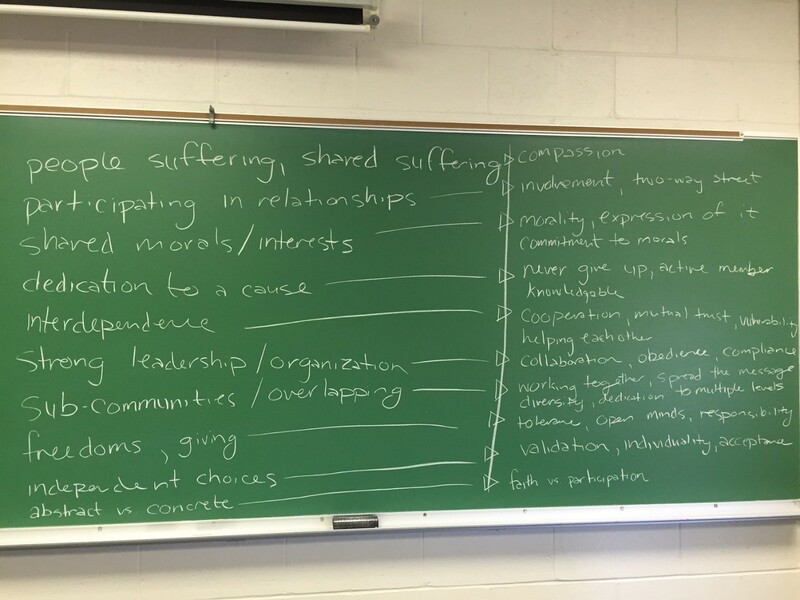 In my Writing as Social Action class, a student scribe listed different conceptions of community represented in the assigned essays. In the second column, students reported what expectations for the individual members would be for each conception/vision of community. Next students discussed among themselves and as a group which conceptions seemed ideal, realistic, problematic, etc. It’s still quite early in the semester, so we will see how turning things over to the students in this way works long term. So far I’ve used this technique for both first-year and upper-level classes, and in both contexts, I was very happy with the insights, level of discussion, and willingness in these polite Midwestern students to gently push back against each others’ ideas. There’s been surprisingly few extended moments of silence and no individuals dominating the conversation. At least 50% of the class is actively participating in the discussions (and I hope to see this number grow). Some things that still need fine-tuning include getting the quiet ones talking while still keeping participation voluntary and free-flowing. I also worry about the students who don’t enjoy class discussions and who may be tuning out because of that. I worry about the super smart students who appear bored or uncertain. I worry about the students I don’t know yet and have difficulty gauging at all. Hopefully with enough variation in class activities and readings, everyone will get their needs met at least part of the time. I’ve long been assigning students reading responses in some fashion or another. Sometimes they submit them ahead of time and then I organize their responses around themes that emerge and use that as a basis for class discussions. Other times the reading response is more like a quiz, demonstrating that they’ve done the reading. Whatever the format, the idea is that students have something concrete in front of them to refer to during class discussions. Where this new technique improves upon those approaches is in giving students the unfiltered latitude to determine the flow of discussion. And prompting them to come to class with talking points assures that at the very least they will have a few places to begin the discussion. As we know, the great thing about teaching is that there is always something more to learn. That can be discouraging too when learning new approaches and techniques feels like a Sisyphean task, requiring great effort with no finish line. So here I am, rolling one more technique up the hill, but I have to say it doesn’t feel as heavy this time. I feel less drained and more energized after class. Class prep prompts less anxiety because I know the students are carrying more of that weight. There’s even energy left over to write a blog post. *Now my class time is divided into three distinct parts: 1) A few retrieval activities that recap the preceding class periods, 2) the student-led discussion, and 3) a wrap-up of the discussion with any points that need clarification/connection/context and setting up upcoming readings, assignments, etc. Hopefully this provides some of the variation necessary to address all the students’ learning needs.